What Does Psoas Muscle Mean? Psoas literally means “muscle of loin” (Greek). Three muscles are associated with what is commonly refered to as “the psoas”: the psoas major, psoas minor, and iliacus. 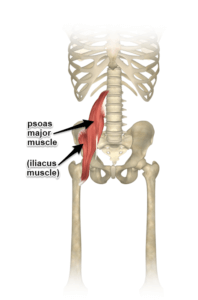 The psoas major is the larger of the two psoas muscles. The psoas minor is the smaller of the two psoas muscles and is absent in approximately half the human population. Where Does the Psoas Muscle Attach? The psoas major’s proximal (closest to the head) attachment is on the sides of the bodies of the vertebrae from T12 through L4. It continues down the sides of the spine, over the front of the pubic bone, and then attaches at the distal end, with the fibers of the iliacus, to the lesser trochanter of the femur. The psoas major crosses many joints: T12–L1, L1–L2, L2–L3, L3–L4, L4–L5, L5 – sacrum, sacrum–ilium (SI joint), pubic symphysis, and the hip joint. 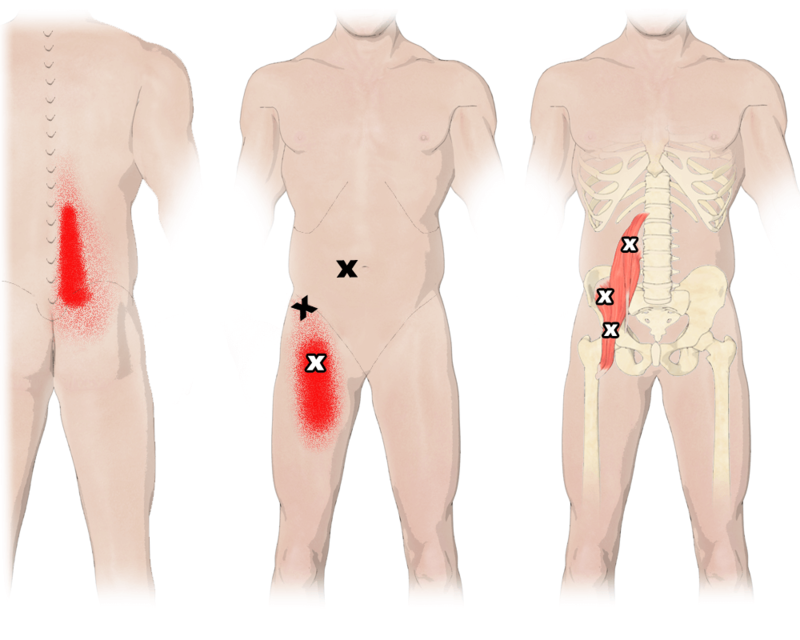 The iliopsoas connects the upper half of the body to the lower half of the body. What Are the Actions of the Psoas Muscle? The iliacus and psoas major are generally grouped together as the “iliopsoas” when referring to the function of either individual muscle. The primary function of the iliopoas is to flex the hip joint. 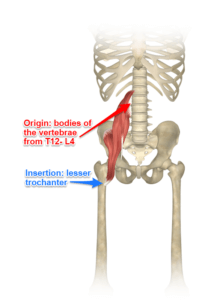 Secondarily, the iliopsoas externally rotates the hip joint. It can also be involved with adduction of the hip if the hip has already been abducted or taken out to the side. 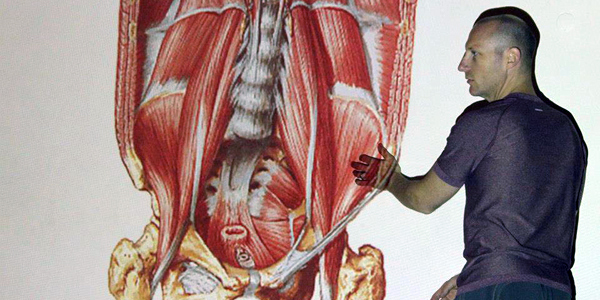 Because of its location, the psoas muscle is ALWAYS associated with the “core” of our body. 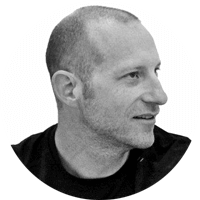 It directly impacts the quality and lightness of our movement because of its relationship to our center of gravity. See my old article on the psoas for more details of moving from your center. Kurmasana requires the psoas muscle to contract. Upavishta konasana requires psoas as well. Navasana is not just about the abdominals. Deep to the abdominals, the psoas is contracting strongly. Dhanurasana stretches the psoas muscle. Virasana not only stretches the quadriceps, but the psoas too. In the back leg of this posture, the psoas is getting stretched. Psoas, like the iliacus, can become sore from repetitive use/stress, either from daily activities like long periods of sitting, or through a sport like running or cycling. Pain can be felt directly at the iliopsoas when sitting for long periods, for example, when driving a car for a long distance. Pain can also refer to other areas of the body, like the lower back. Resting the muscle by taking a break from your activity can help alleviate acute pain. Due to where the psoas is located deep in the body, a skilled professional body worker may be needed to treat psoas syndrome/overuse. Should The Heels Be Lined Up In Revolved Triangle And Warrior Pose? David explains why having the heels lined up in revolved triangle and similar poses is not the only way to align the feet. It all depends on your intention. What Are We Doing In Bhujapidasana? 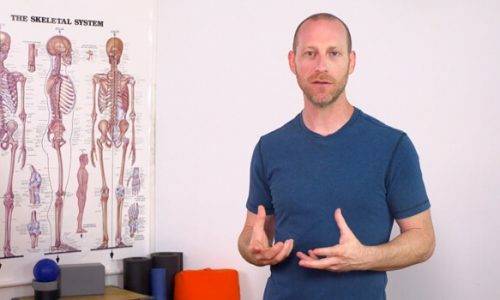 David describes the anatomy of what is happening in bhujapidasana and explores techniques for evolving this challenging posture. 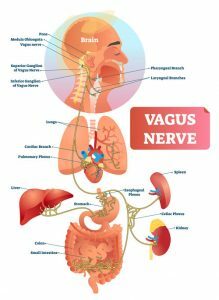 Researchers propose a model which suggests that yoga and other contemplative practices work by using specifically regulated breathing techniques (low respiration rate, long exhalations) which stimulate the vagal nerve, and in that way, positively affect the parasympathetic nervous system. Pl inform the short comings in dail life when the psoas is shortened due to lack of use/lengthening.